A sparse crowd looks on as Northwestern takes on Nebraska in January. The Athletics and Recreation Department has offered a few groups exclusive benefits to encourage attendance at games. 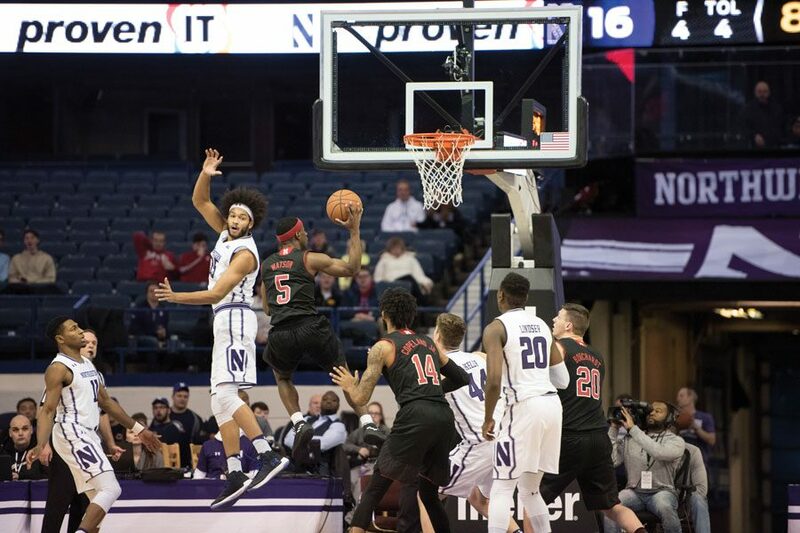 Northwestern Athletics is doubling down on efforts to boost student attendance at basketball games after construction at Welsh-Ryan Arena forced several sports to relocate their home games. The Department of Athletics and Recreation has offered Interfraternity Council chapters and club sports teams targeted benefits for attendance at men’s and women’s home basketball games this year, including private transportation and the chance to win cash prizes, according to emails sent to student groups. The men’s and women’s basketball teams have temporarily relocated their home courts to Allstate Arena in Rosemont and Evanston Township High School, respectively, after renovations to Welsh-Ryan Arena began last year. The Wildcats are scheduled to return to campus next season. While ETHS is just a mile and a half away, Allstate, about 15 miles from campus, is significantly farther. The attendance rewards aren’t new to Northwestern sports. When games were still at Welsh-Ryan, student attendees were previously offered some apparel items and food. But this year, students are offered a $15 concessions voucher at every game and typically guaranteed athletic apparel if they make the near-30 minute trip to Rosemont. Some groups are being offered additional, exclusive benefits. IFC members were offered transportation for a Jan. 20 game against Penn State via wifi-enabled buses usually reserved for athletes, according to one email. The chapter with the most attendance at the end of the season would also win “huge prizes,” potentially custom Under Armour gear or a personal visit from coach Chris Collins, according to the email. The department will also host a “Club Sports Day” on Feb. 11 for a women’s basketball game against Iowa State. Club teams who send at least three members will be entered into a raffle to win up to $500 for the club’s Student Organization Finance Office account, according to a different email. These “group attendance competitions” have been offered to larger student groups for “many” years, the Department spokesperson said, though they only specified the eSports club as an example. It is not known whether other groups have been offered similar incentives, as the spokesperson did not respond to additional questions. These offers were also not advertised publicly, but rather emailed to members of the organizations. Weinberg junior Ryan Tung said though he attended about four games last season, the increased travel time has “100 percent” discouraged him from attending games this season. With school and work, Tung said he doesn’t have enough time to “drop everything and go,” and instead watches the games from home. Despite the location change, ticket sales have reached a new record, the spokesperson added, though Allstate seats about 10,000 more attendees. The spokesperson did not respond to additional questions about student attendance. Incentives have become part of the gameday experience for Northwestern’s students, who are often seen as less enthusiastic than fans at some other Big Ten schools. And though the spokesperson said these incentives are “not new,” the marketing initiative suggests the athletic department may continue to expand its rewards to encourage student attendance.